We want to thank everyone who has helped with the launch of this website. 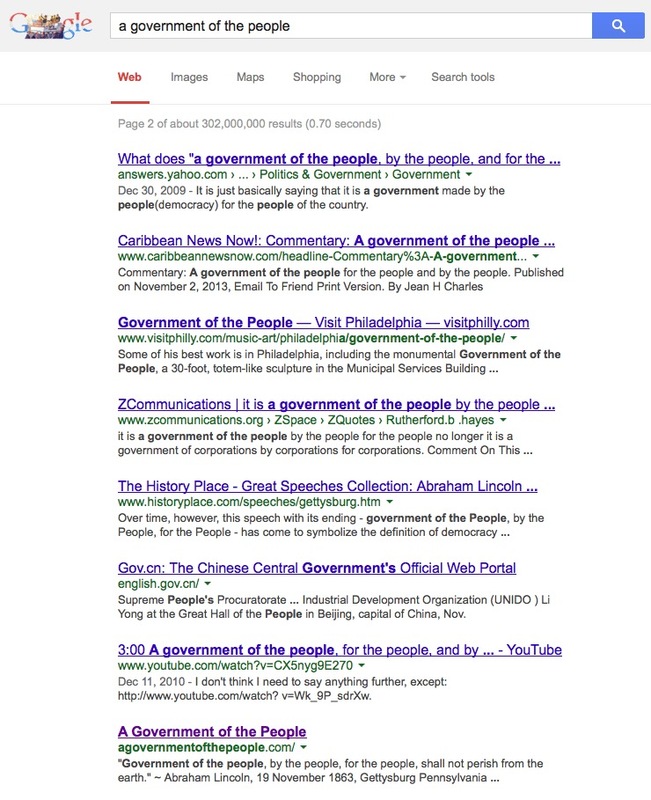 In a relatively short period of time, since 28 October 2013, we’ve seen the site get to the top 20 list on a Google search for “a government of the people” (without quotes). Being in the top 20 out of over 300 million results is something to celebrate. This accomplishment was achieved without any performance enhancing SEO tricks. Instead, we’ve simply ensured that the content is clean, focused, and as well written as possible, with effectively used keywords that stay true to the topics and mission of this website. Top rankings on Google isn’t our goal. Our goal is to inspire, educate, and empower people with information that will help them achieve optimal forms of governance in their organizations, businesses, and governments. Inspired by the Gettysburg Address, this site aims to take that message and reverse engineer how one might establish and optimize a government of the people. Below are the search results as of 11 November 2013.